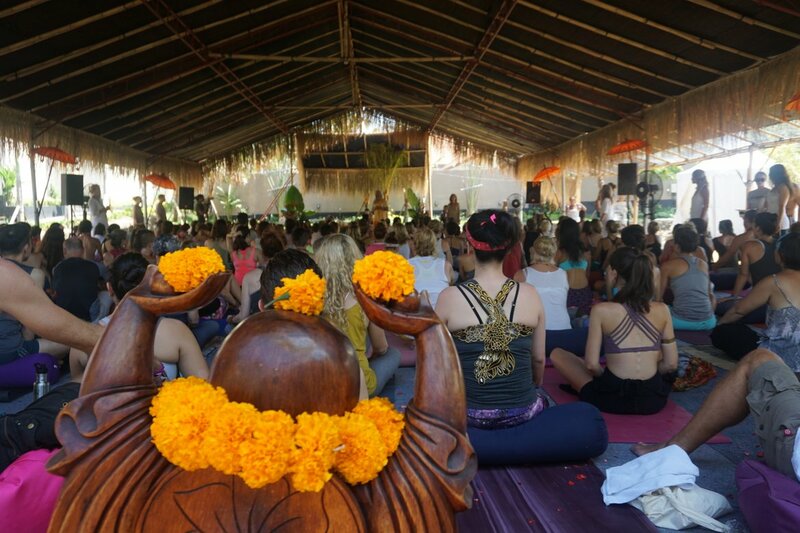 One of many classes at Bali Spirit Fest. Bali had long been a top tourist destination, with millions of people visiting the Island of the Gods every year. However, the terrorist bombings of 2002 and 2005 brought about devastating impacts on the tourism industry and thus the economy of the island, which relies heavily on it. Seeking to find an environmentally and economically sustainable event to draw more tourists back to the island, three friends were able to put together the first ever incarnation of the festival in just three months back in 2008. 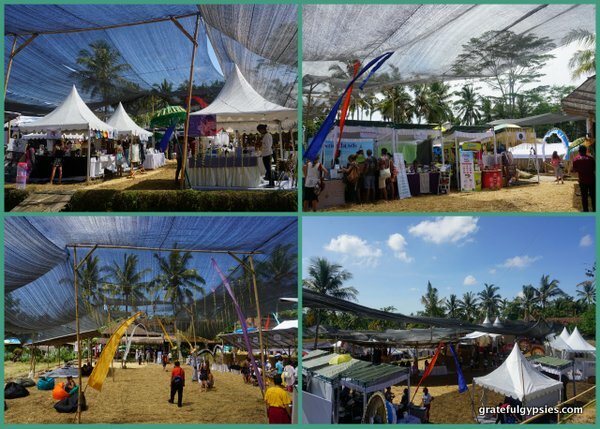 Within a few short years, the Bali Spirit Festival grew to a world-class event, bringing in over 6,000 people by 2012. 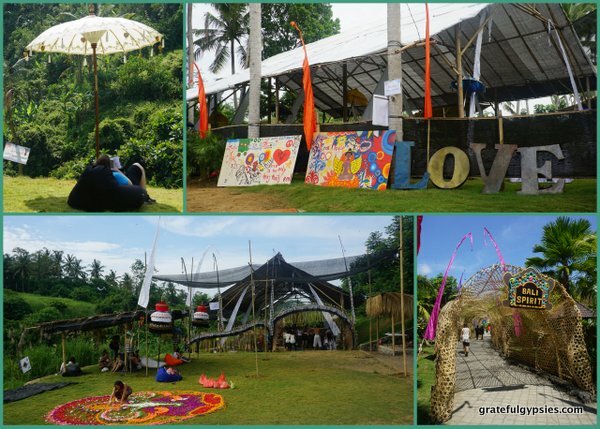 In its 9th year, the festival moved to a brand new location – the Bhanuswari Resort – that it hopes to call home for years to come. Bhanuswari – the daytime venue. The festival takes place over five days, with the weekend being the busiest time. It’s split into two venues – Bhanuswari for the daytime and the nearby ARMA Museum after dark. During the day, attendees can join all sorts of classes and workshops. 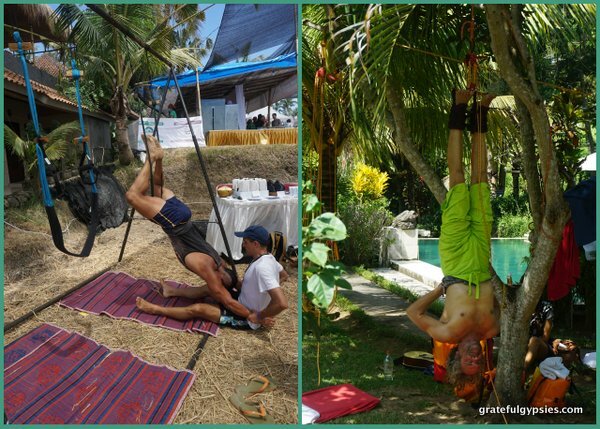 Although it’s very much a yoga festival, Bali Spirit also has tai chi, capoeira, and breath work, just for starters. These usually last for 60-90 minutes, and are led by world-class instructors. 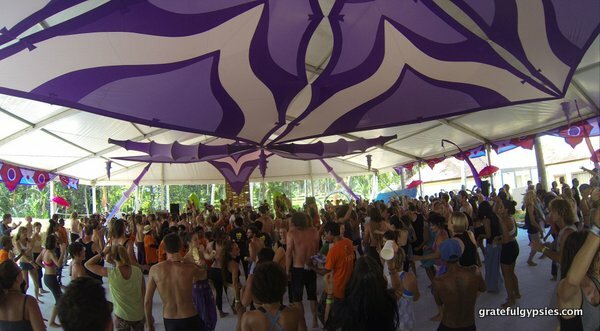 All classes take place in the large tents and pavilions that are constructed just for the festival. They’re all totally open on the sides, allowing for a nice breeze and some great views of the surrounding valleys and rice fields. The large pavilions can hold upwards of a few hundred people, so it’s usually not too hard to find a spot in a class. Another section of the festival is the Dharma Fair, an outdoor marketplace featuring vendors selling everything from jewelry, clothing, yoga supplies, and even gelato. 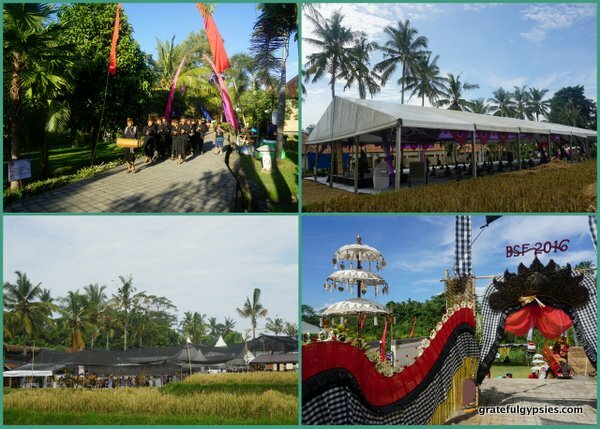 This area is separate from the main festival, and is great for those wanting to experience Bali Spirit Festival without buying a full-price ticket. 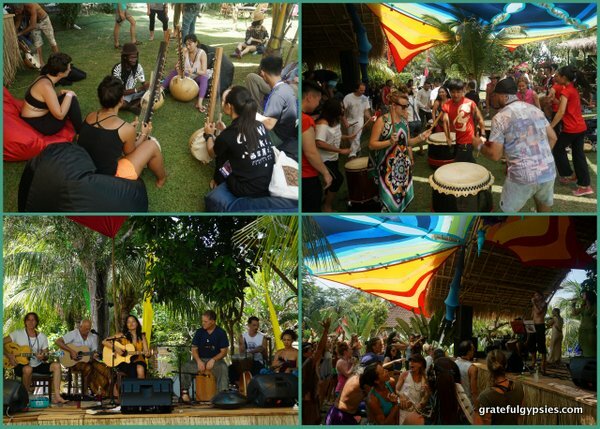 For just a few bucks, you can get a day-pass for the Dharma Fair, which also has a Community Pavilion hosting a variety of classes and and the Coco Love Stage, where you’ll be able to take part in musical workshops and watch a talented array of musicians perform. Nighttime is the right time at ARMA. Things wind down at the daytime venue at 5PM, and there’s a short break before things start over at ARMA. Single and 3-day passes are available for the musical portion of the festival, where you’ll be able to see acts from all over the world. This year featured performers from the US, Argentina, Poland, Malaysia, Australia, and more. Headliners included Nahko & Medicine for the People, Opiuo, and Lulacruza. Posing with a lovely ogoh-ogoh after our shift. Such a large festival requires a large team, and you can be a part of it as well. 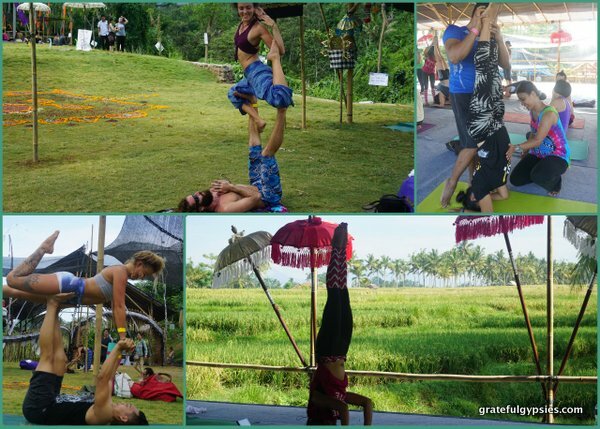 Every year, Bali Spirit takes on well over 100 volunteers to assist with all aspects of the festival. In exchange for 25 hours of your time, you’ll get full access to both the daytime and evening venues, as well as a little after party the day after the fest wraps up. It’s a tiring week, but it’s worth it – you meet tons of amazing people, help out with a very positive event, and get to take part in all sorts of classes, workshops, and concerts. It should be mentioned that volunteering is not completely free. Each and every volunteer must pay a $50 “impact fee,” which is non-refundable. Before you get all up in arms about this, think about it for a second. Volunteers get two nice t-shirts, a free meal for every shift, free shuttle passes (if you want them), and total access to a festival that costs $650. Plus, the festival gives tons of money away every year to their various community initiatives. It’s well worth it, and it’s a small price to pay for such a great experience. Read on to find out all about our experience volunteering at BSF ’16. 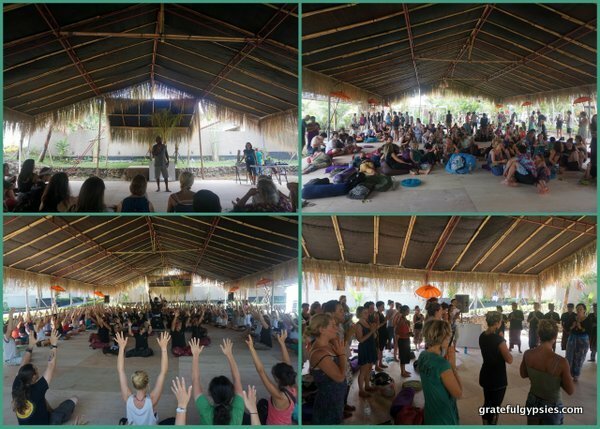 All volunteers were required to attend a day-long orientation on the Sunday before the festival. This was mostly just organized chaos, as they tried to check-in 150+ volunteers and get everyone t-shirts. Thankfully the afternoon session was much more interesting and productive, as we heard from the founder of the festival, met the team leaders, and got an interesting talk on Balinese culture. The highlight of the day was learning how to do a kecak dance from a local troupe who tours internationally. Volunteers are given a choice of morning (7-12), afternoon (12-5), or evening (5-10) shifts, and you have to do the same shift for all five days of the festival. As we’re way more into music than yoga, we opted for the morning shift to leave the rest of the day free. In hindsight, it probably would have been better for us to take the afternoon shift, as we’re notoriously awful at getting up early. It was a tiring week, but having the early shift did allow us to join at least one class every day, take a nap, and show up for the music ready to dance and let loose. Some more scenes from the festival grounds. There are lots of areas that volunteers can help out in – the box office, checking people in, information booths, wristband checks, and manning the table at one of the tents are the most common. Although I was hoping to get put on the photo/video team, I ended up at the Dharma Fair. The first couple of days saw me running around quite a bit, moving chairs and tables and making sure all vendors had what they needed. Once things got rolling, though, I barely had to do anything. I mostly just hung out, explored with my camera, and did random tasks when needed. Rachel, however, had to be at the volunteer check-in every morning at 6:45 and remain there until noon. While it wasn’t exactly difficult, it was rather tiring and stressful at times for her. We felt upside-down at times. We’ve volunteered at tons of festivals – we even met at one – but mostly at those of the hippy jamband variety back in the US. 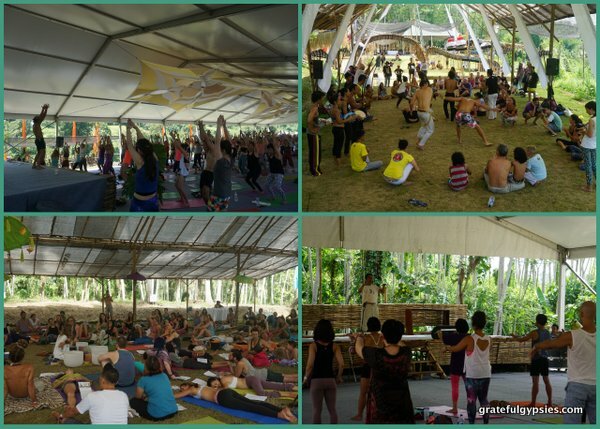 Being a part of a festival that is primarily about yoga, new-age healing methods, and things like ecstatic dance proved to be a bit of a culture shock for us. That being said, it’s always interesting to experience totally new things, especially in a festive environment with a bunch of cool people. While we probably won’t be taking up vegan diets, regularly balancing our chakras, or doing double helix breathing exercises in the future, we certainly learned a lot and enjoyed the experience overall. If you’re interested in attending or volunteering next year, here are a few things to keep in mind. The new venue is actually quite far out of the center of town – about a 15-20 minute drive heading south. 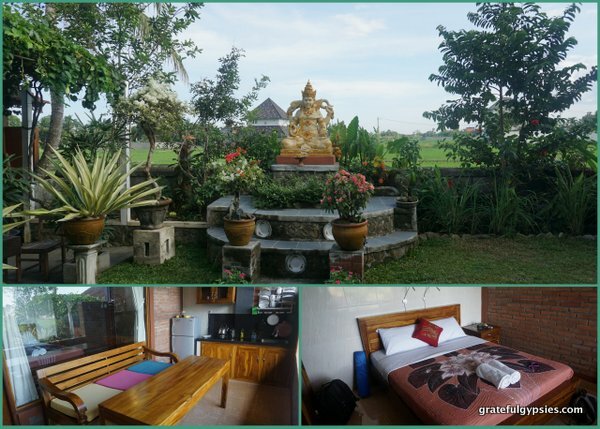 There are some nice homestays that are only 10 minutes or so away from both Bhanuswari and ARMA, so you don’t have to make the long trek through crowded Ubud if you don’t want to. We absolutely loved our room at Made’s place – we had our own little porch with a kitchen, the room was spacious and comfy, and he’s one of the nicest guys we’ve met in Bali. For around $15/night this was definitely a steal. If you’re not on Air BNB yet, you’ll want to sign up before your trip to Bali as there are tons of awesome places to stay on there. Follow our invitation to Air BNB to get $20 off your trip and help us out earning referrals. For getting to/from the venues, it’s best to just rent a motorbike. You can get these for 50,000 Rupiah/day (around $4) or bargain for a little less if you’ll be renting for a few weeks or a month. If you just can’t stand the thought of riding, the festival has a shuttle (which is free for volunteers), and just about every other person in Ubud is a driver (“Hey boss, you need transport?”). 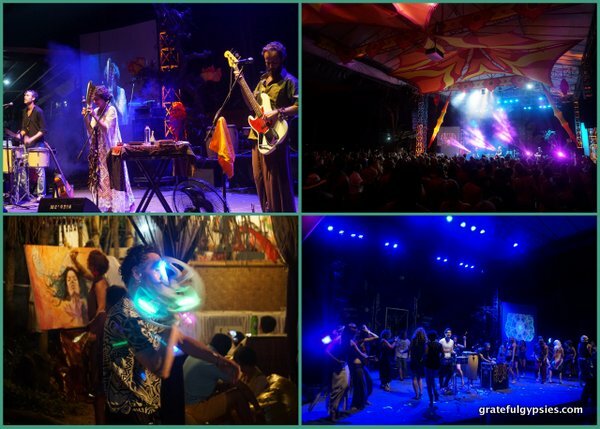 We put together a short video to give you a taste of what Bali Spirit Festival is like. 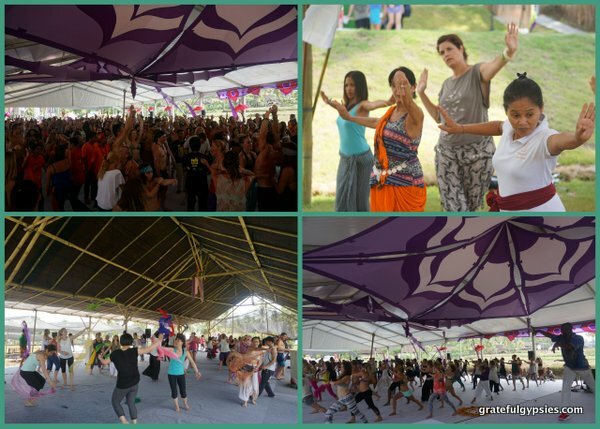 Check out five days of yoga, dance, and music in just under 3 minutes! For details on next year’s festival and volunteering at it, stay tuned to their website. 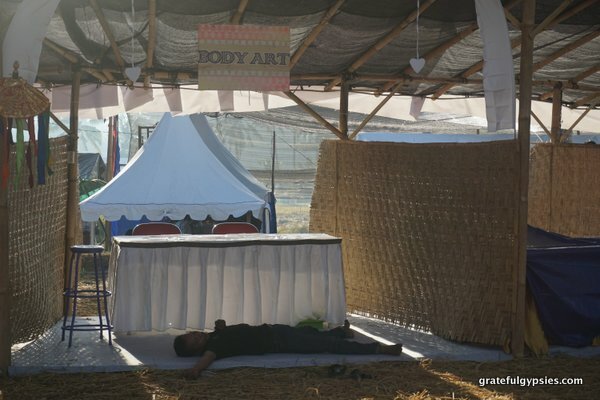 Bali festival doesn’t provide free stay for volunteers? No, unfortunately, they do not. There are lots of options in and around Ubud, though! Hey we’re volunteering this year! This is super helpful to get started, we’re going to secure a place to stay and we’ll mostly likely get the moto when we arrive right? Great review on volunteering at the Festival. I’ll be in Bali during this time and this sounds awesome. Is it difficult to secure a volunteer spot or are most people accepted? Hey James! Thanks for the comment. There were a TON of volunteers, so I’d say if you express your interest and it’s clear that you’ll definitely be in Bali (and that you don’t mind paying the fee, of course), they’d take you on. Let us know if you have any other questions about Bali. We spent almost a year there so we know lots of good places. Working on more posts for the blog about it in the near future as well! Awesome..Thanks for following up with me. Going to be spending next March and April in Bali. I’ll be on the lookout for your future post. Y’all have a great site and I dig your choice in music!